When it comes to pizza, we all want that perfect pizza. A puffed crust, a thin base, dripping in cheese and of course one straight out of the wood-fire oven. Here are the best places to find just that in London. I first tried Rossopomodoro when they took residence on the John Lewis summer rooftop and from then on I have become a regular. They have many branches in London that include a spot in the John Lewis Oxford Street store and a stand-alone restaurant in Covent Garden. 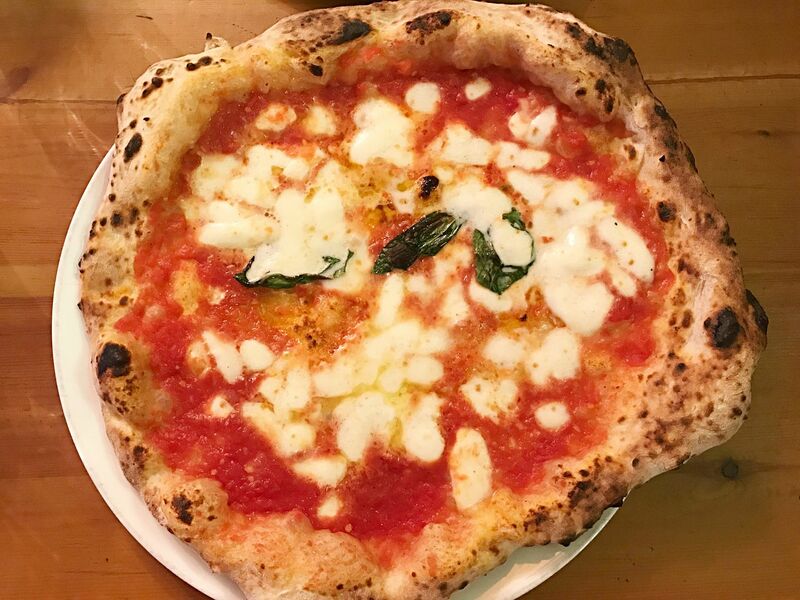 This authentic Italian restaurant know how to do wood-fired pizza and just what you would expect from a true Italian style pizza. They also have a full menu with pasta and other inspired Italian dishes, but the pizza for me is just top marks. I’m also a fan of their desserts, which includes a Nutella offering. Pizza and Nutella yep, I’m obsessed. Franco Manca hits all the spots. Great pizza, no fuss service and pizzas starting from just £4.95. They have branches all around the capital including London Bridge, Covent Garden and Soho. The pizza menu includes your simple Margherita with tomato, mozzarella and basil to something a little more adventurous like the Gloucester old spot ham, mozzarella, buffalo ricotta and wild mushrooms pizza. Wine is served up in tumbler glasses and starts at just £4 a glass. It’s pretty obvious to see why this is definitely one of the most visited pizza spots in London. Pizza East is part of the Soho House group that includes the likes of Dirty Burger and Chicken Shop. This is their pizza restaurant and it’s easy to see why this place gets filled up to capacity most nights. The pizza is thin, crispy and so tasty you’ll just want more. Find Pizza East in Shoreditch, Kentish Town and Portobello. Pizzas include offerings such as a black truffle, taleggio, mozzarella and cream to veal meatballs, prosciutto, cream and lemon. If your fellow diner isn’t into pizza, they can try out the mac’n’cheese or maybe the crispy pork belly from the wood oven menu. Pizza Pilgrims has always been one of my favourite pizza spots. 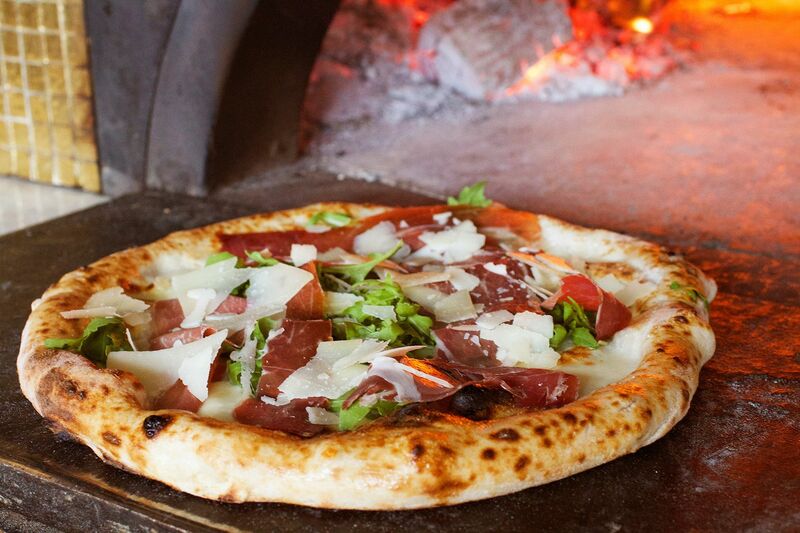 Wood-fired pizza with a simple and easy menu. Not to mention their delicious iced Pococello limoncello. 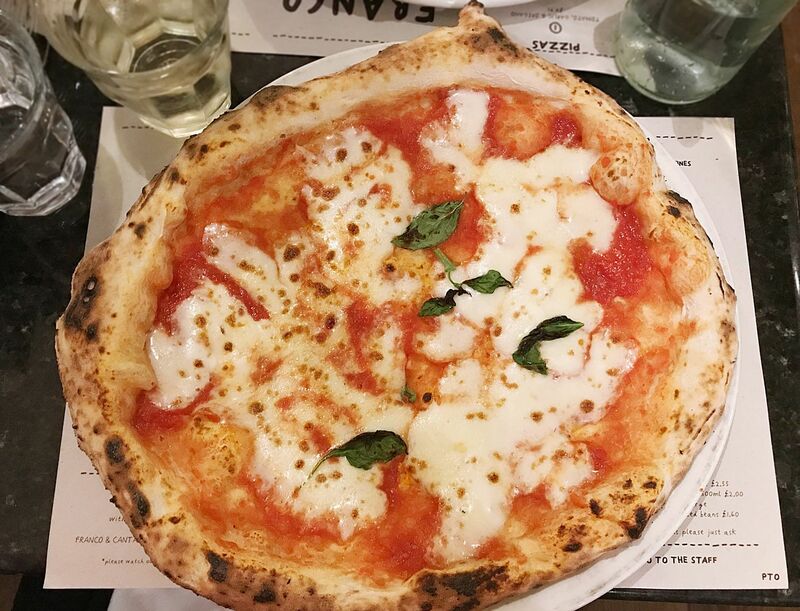 You can find Pizza Pilgrims in seven locations across London including Covent Garden and Exmouth Market. Pilgrims have a handful of different pizzas on offer, I recommend trying the Nduja with spicy Calabrian pork sausage or one of the white pizzas, such as the Portobello & Truffle with portobello mushrooms, fior di latte, parmesan, basil and white truffle oil. Pizza prices start from £5.50 and you can also choose from side salads and make sure you try out their pizza crust dipper sauces. If I’m ever in Central London, I know to go to Mayfair Pizza Co for my pizza. 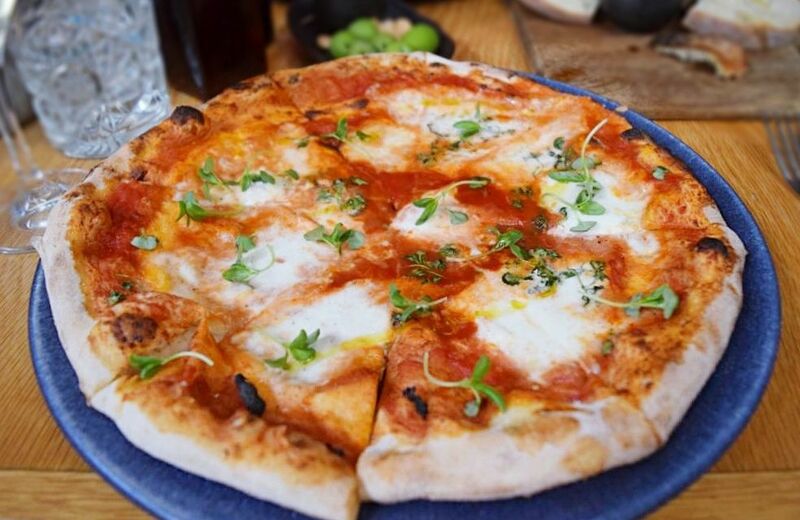 If you like things a little more with a restaurant vibe then Mayfair Pizza Co is your pizza preference. 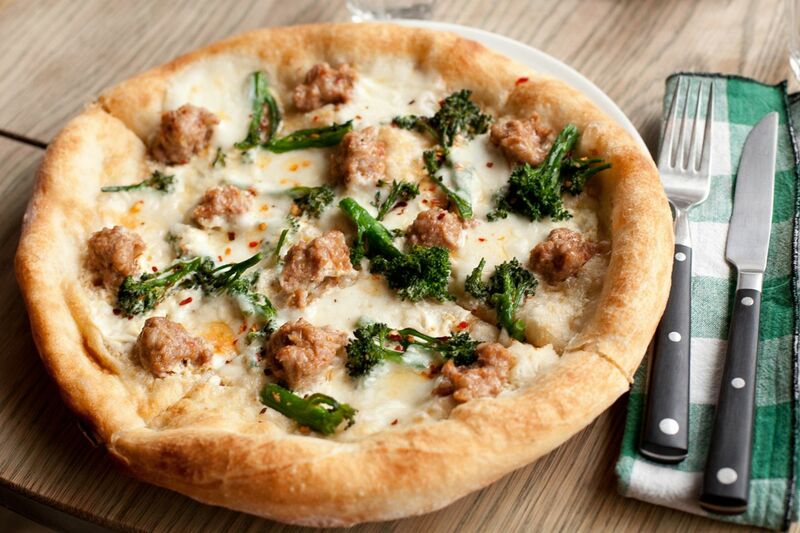 With a vast menu, their pizzas are delicious and the dessert, well you can have pizza too. One of my favourite desserts is the Nutella and marshmallow calzone, seriously you have to try it! They also run pizza classes where you can make your own pizza, which I have been lucky enough to take part in as part of an event before. Pizzas include; Caprina with tomato, goat’s cheese, red peppers, rocket and parmesan and the Boscaiola with tomato, mozzarella, prosciutto, mushroom, parmesan and basil. Read Mayfair Pizza Co review. I have to say, as an American expat living in London for the past 8 years, I’m always DESPERATE to find good pizza. The closest I’ve tasted to proper New-York style pizza (I mayyyyy be a bit biased calling that ‘proper pizza’) is Icco Pizza on Goodge Street. But I do love the other ones you’ve mentioned as well! I’ve never actually had Mayfair Pizza Co before, so that will definitely be my next try. Oh, and as an honourable mention, Pizza Union is fab for being both delicious AND gloriously inexpensive. The dream combo. Try Bizzarro on Craven Road Paddington. We’re just tourists in Londen but every year we eat there at least twice during our stay! Very friendly owner en superb food!